Climbing Mount Olympus in Greece - Everything you need to know! Mount Olympus in Greece is known from the Greek mythology, where it represents the residence of twelve Greek gods. The peak Stefani is even considered to be the throne of Zeus. Mount Olympus is however much more than that. The landscape and surroundings put this elevation easily on the list of the most iconic peaks in the world. 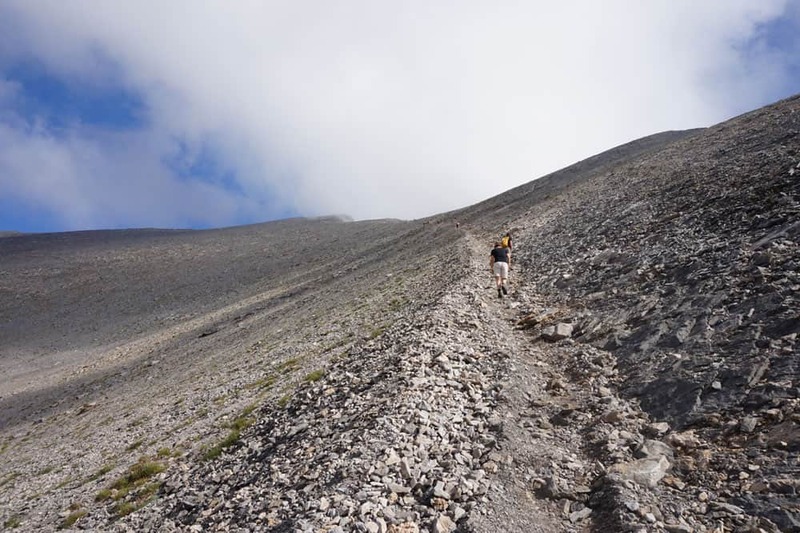 Are you adventurous enough to conquer the Greek mountain of gods? Read this guide to ensure you have the best experience while climbing Mount Olympus. How much time do I need to climb Mount Olympus? 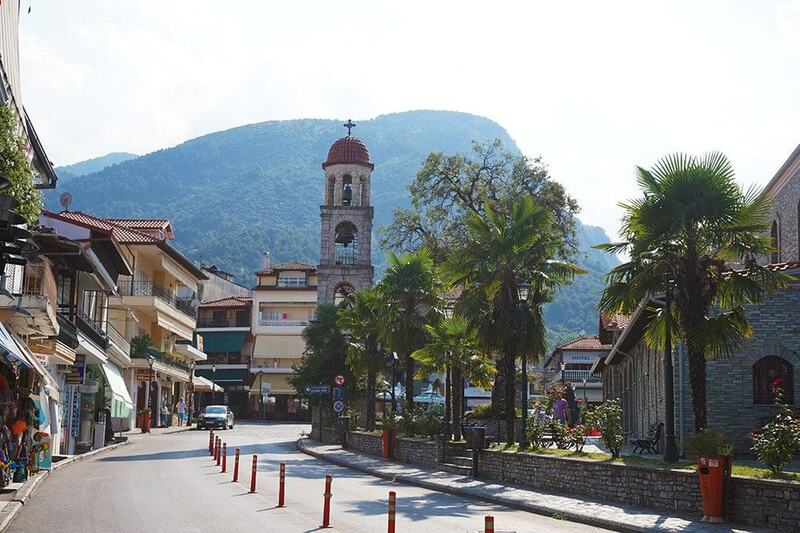 There are several options when it comes to getting to Litochoro, which is the base camp for all hikers who aim to ascent Mount Olympus. You will be departing most likely either from Athens or Thessaloniki. If you have the budget to rent a car, this will be the most flexible and time efficient way to explore the mainland of Greece. The trip from Athens to Litochoro takes 6 hours (if you will try to avoid the toll roads it will take you 8 hours). If you start your journey from Athens, I would suggest you make stops on the way and split the trip into few days. Meteora monastery complex should be on your list, when visiting Greece. From Thessaloniki you can reach Litochoro in around 1 hour. Depending on the connection you choose, the train ride can take from 6 hours up to 8 hours. One option is to take a train from Athens Liosion Station to Katerini, where you change for another train to Litochoro. You can also take the train to Larissa and then a connecting train to Litochoro. The prices vary from 30 EUR to 60 EUR. Be aware however that the train station in Litochoro is around 6 km away from the city. You will need to take a cab or ask locals to give you a ride to your accommodation. Cheapest option to get to Litochoro from Athens is by bus, which is around 40 EUR and takes more or less 8 hours with transfer in Katerini. From Thessaloniki it costs only 10 EUR and takes around 2 hours. If you are really on a budget, you can try hitchhiking. From my own experience, hitchhiking from Litochoro to Athens worked very well and it took around 8 hours. There are a lot of truck drivers taking the route from Thessaloniki to Athens. The advantage of taking a bus from Thessaloniki is that it drops you right in the city, so you don’t need to take a taxi. If your budget allows you to rent a car, this will be the most convenient solution to move around Greece. Additionally you are much more flexible, which gives you options to make stops around the route whenever you want. Litochoro is a small city on the bottom of Mt. Olympus in Greece. It is recommended to arrive one day in advance to prepare for the hike, get supplies such as water, food and good sleep to be able to start early the next morning. When it comes to accommodation there is not that many options, particularly if you book last minute while being on a budget. We stayed at an Airbnb in the middle of the town for about 25 EUR for two guests. If you can plan your trip in advance, I suggest to book your accommodation as soon as possible as the options are limited. I highly suggest that you are well rested and bring food and water with you, good hiking shoes should also be considered. Hiking sticks are not a must, but it feels good to have some support when climbing up Mount Olympus. Any suitable piece of wood you can find on your way is also sufficient. Be aware that climbing Mt. Olympus should not be underestimated. 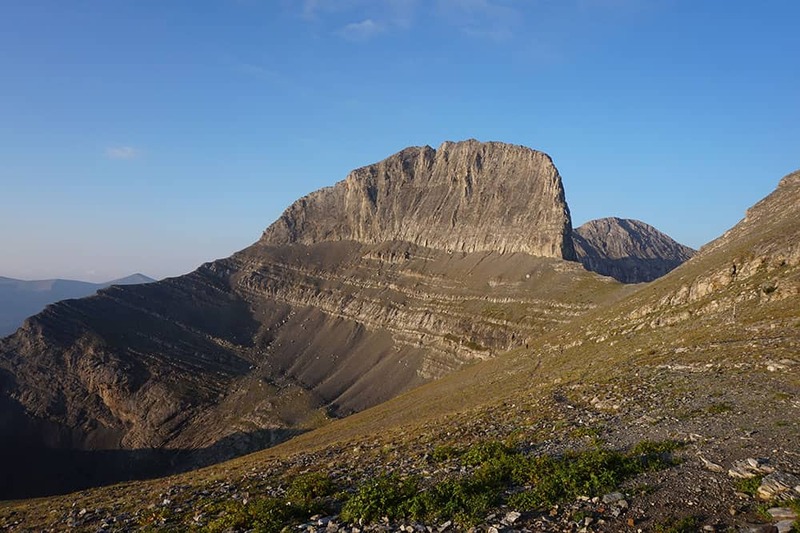 If you plan to reach one of the three peaks, you will highly likely need to use your hands and climb the mountain.Make sure you are in a good physical condition. Don’t forget to bring some warm clothes with you, even in mid-summer it gets quite cold above 2000 meters. Equipped with a map, some food, water and warm clothes we started the hike the following morning at 8 AM. You should know that there is no public transportation that can bring you to the beginning of the trail, you can take a taxi for 25 EUR or hitchhike (my preffered method). Depending on which track you choose, you need to get yourself to Gortsia or Prionia which are 9 km and 12 km away from Litochoro. To get to the beginning of the trail we hitchhike. Most of the people start climbing up to Mount Olympus around 9 AM. Starting at 8 AM gives you a better chance to catch a ride and start your hike to Mt. Olympus as soon as possible. If you plan to hitchhike as well, write a sign and get yourself to the road to Gortsia. Coming from the roundabout at the Litochoro police station you need turn left, cross the bridge and walk around 300 meters and turn left again. You should be on the right way that leads to Prionia and Gortsia. Trail 2 starting from Gortsia is much less popular, therefore you will not meet many tourists, the nature is also more vivid, landscape changes and there is a good part leading you only through the woods. We decided to take the trail 2 up the mountain and trail 1 on the way back. Luckily the people who gave us a ride to Gortsia were local firemen with years of experience on the mountain. Since our goal for the day was to reach refuge camp B (Apostolides) we build a group and hiked up together. The trail leads you through the woods to the first refuge D (Petrostrouga), this is a small refuge, where you can have some food and tea, rest a little and continue the hike. The landscape is changing and we are out of the woods, the soil is changing into rocks and we are on our way to the Plateau of Muses. Upon arrival at Plateau of Muses you can see two refuge camps, C – Christos Kakkalos a small cozy refuge and B – Apostolides, the highest refuge on the mountain with a common room to socialize and ice cold showers if you are brave enough. If you plan to hike with your dog, consider that dogs are not allowed to enter. Some guests pitched a tent and slept with the dog outside. I recommend to book the accommodation in advance to make sure they have a bed for you. For the refuge Apostolides just call (+30) 23510 82840 and let them know when you arrive. Find out the contact information of other refuge camps here. The location of refuge Apostolides is a good spot to start ascending Mount Olympus, which consist of several peaks. Right next to the Apostolides refuge you can see the breathtaking Stefani, followed by Mytikas, Skala and Skolio. First be aware of the weather conditions and don’t underestimate the difficulty of the hike. Always ask in the refuge camp about the conditions and their advice on ascending Mt. Olympus at the day of your visit. If there is rain in the night, climbing up to the highest peak Mytikas might be very dangerous and not recommended, according to the local fireman. Depending on the route you choose, wearing a helmet in some parts is a good choice. You can borrow these in the refuge camps. In case you start from refuge Apostolides, you can take a shortcut up to Mytikas that goes literally steep up to the summit, it is shorter but as an inexperienced hiker I would not do it alone. The other option is to take a loop hike as seen on the map and reaching the peak of Skala first and then hike further up to Mytikas. Make sure you don’t underestimate your capabilities and experience, there are few spots where you need to use your hands to climb up the mountain so be aware of that. Depending on your route and capabilities, you can descent the same day as you reach the peak or stay one more night at one of the refuge camps and descent the third day (recommended). The descent of Mt. Olympus will take you the same time as the ascent and for many hikers it can be even more exhausting. Having hiking sticks with you will certainly easy the pain in your knees. 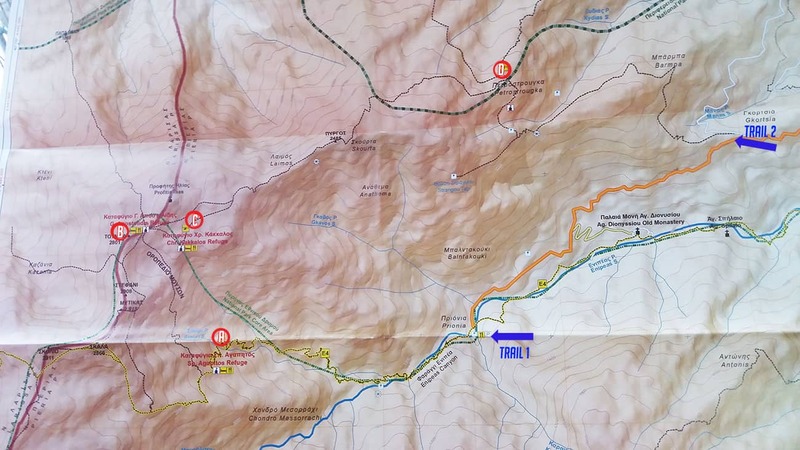 As for inexperienced hikers the trail 2 to the refuge camp Apostolides took us 7:30 hours with 1 hour break. From here you need another 3 hours to Mytikas. The trail 1 is supposed to be faster, approximately 4 to 5 hours to the refuge camp Apostolides or around 7 to 8 hours to Mytikas. Experienced hikers can make it to the summit in around 5 hours. Take into account that the hike between Litochoro to Prionia (beginning of the trail) takes around 4 to 5 hours if you don’t have any transportation. We spent two days on the mountain, with the arrival combined we needed 3 days. To make it up to the peak of Skala and down in one day is quite a challenge and it would be a pity not to spend more time in that breathtaking environment. I would however recommend at least two nights at Mt. Olympus to allow time to connect with the nature. How to get to Mt. Olympus? The most convenient option to get to Mt. Olympus is by car. The trip from Athens to Mt. Olympus takes at least 6 hours. If you plan to rent a car in Thessaloniki, you will need to drive for about one hour. How long does it take to climb Mt. Olympus? The duration of the hike depends on your physical fitness, hiking experience, weather conditions, the chosen trail and the peak you aim to conquer. Super fit hikers can reach the peak in four to five hours. Casual hikers will need between seven and nine hours to reach the top. It is advised to split the hike into two or three days. Can you climb Mt. Olympus in a day? Only experienced hikers are able to hike Mt. Olympus in one day. It will take you at least 8 to 10 hours. Don’t underestimate the difficulty of the hike as well as the weather conditions at the mountain, which can have a big impact on the duration you will need to for the hike. What is the elevation of Mt. Olympus? 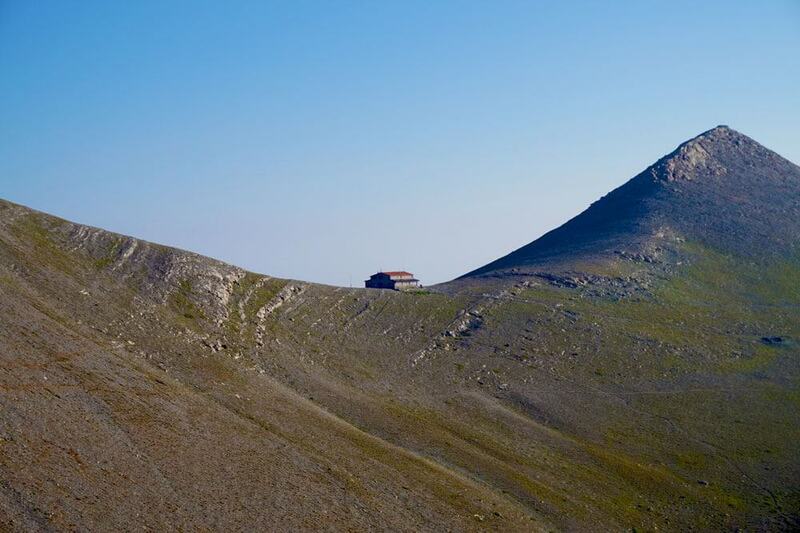 The greek Mount Olympus is elevated 2.917 meters above the Aegean Sea. The base town Litochoro is elevated at 293 meters above the sea level. Is climbing Mt Olympus dangerous? The ascend up Mount Olympus is not easy and is considered as a class 3 climbing route (Scrambling or un-roped climbing). Particularly close to the peaks you must use your hands most of the time to follow the path. Be aware of steep and partially extreme terrain. Some of the peaks such as Mytikas and Stefani have optional technical climbing routes. Is it possible climbing Mt. Olympus in winter? The refugee camps at Mt. Olympus are closed in winter. Some of them are open for the weekends only. If you plan to hike Mount Olympus in winter, you can stay at one of the emergency shelters at the refugee camps, which are open all year long. If you insist on hiking Mount Olympus in winter, you should book a guided tour, led by experienced climbers. You don’t need any special climbing gear to climb Mt. Olympus. Solid hiking shoes are recommended (running shoes are not that great), take enough water, food (sandwich or snacks), warm clothes (it’s around 0-10 degrees on the top), a map is a must. Also take some small first aid kit, you will never know what you can use it for, I cut myself on the razor sharp stones and got bitten by some insects that resulted in a swollen ankle. To climb Mount Olympus is one of the best activities you can do on the mainland of Greece, absolutely breathtaking landscape and a great way to connect with the nature. Anyone who loves outdoors and is comfortable hiking for a longer time can reach the peak and enjoy the views from Zeus his throne. Did you climb Mt. Olympus in Greece? Let me know your experiences in the comments below.